Good Morning everyone!! WOW!! What a BEAUTIFUL morning! I've already gone to the gym this morning...tough bootcamp! I go faithfully but don't seem to lose much weight...I like food too much! I think I workout so I CAN eat...lol! Actually, I have a love hate relationship with the gym...I HATE getting up early so it's really difficult for me to be there by 5am! I LOVE how I feel after a good work out...EXHAUSTED, but ENERGIZED...if that makes ANY SENSE at all!! Well...back to the BEAUTIFUL morning! When I took kids to school this morning the sky was blue and the fall colors were vibrant. 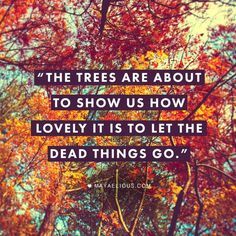 It makes me so happy when my kids notice the beauty around them and it was that kind of morning today...they both said how pretty it was! What a BLESSING!! Well...I have to get out and finish getting my World Card Making kits together today so I better hurry up and share what I have for today! This is another Tic Tac Toe Challenge project. The challenge was to use Christmas Themed designer paper! SUPER EASY! I absolutely LOVE the Merry Little Christmas designer paper pack so that is my background for this card. It is mounted onto Basic Black cardstock and then onto a Whisper White card base. I used my Stitched Shapes framelits to cut the stitched circle in Old Olive cardstock. The trees are from the Card Front Builder framelits. 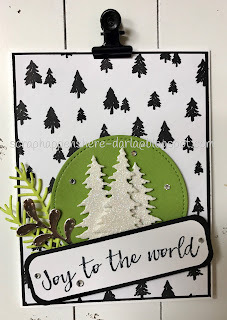 I used the Pretty Pines thinlit dies to cut the details from Lemon Lime Twist cardstock and Silver Foil Sheets. The sentiment is from the Hearts Come Home stamp set...its a TERRIFIC Bundle! OF COURSE I had to add some Rhinestone BLING to finish it off!!! I have one more Tic Tac Toe Challenge project to share with you tomorrow so be sure to stop back by! Thanks BUNCHES for checking in today and letting me share another creation with you!